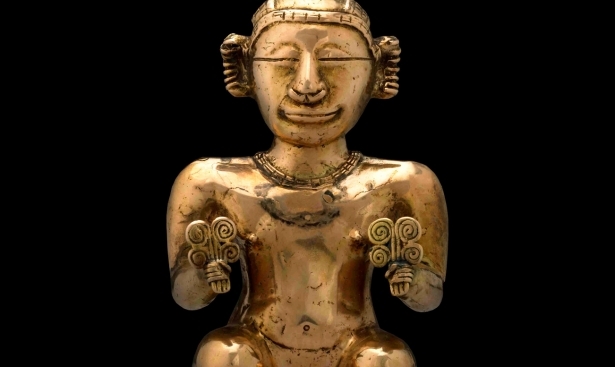 How does a ton of gold look like? In 2011, the mint workers of the city of Perth, Australia produced a unique one-million-dollar gold coin. The Australian mint originally came up with an idea of creating such a sophisticating banknote to promote the Kangaroo Gold Bullion coin series. The giant gold bar was named "1-Tonne Gold Kangaroo Coin ". 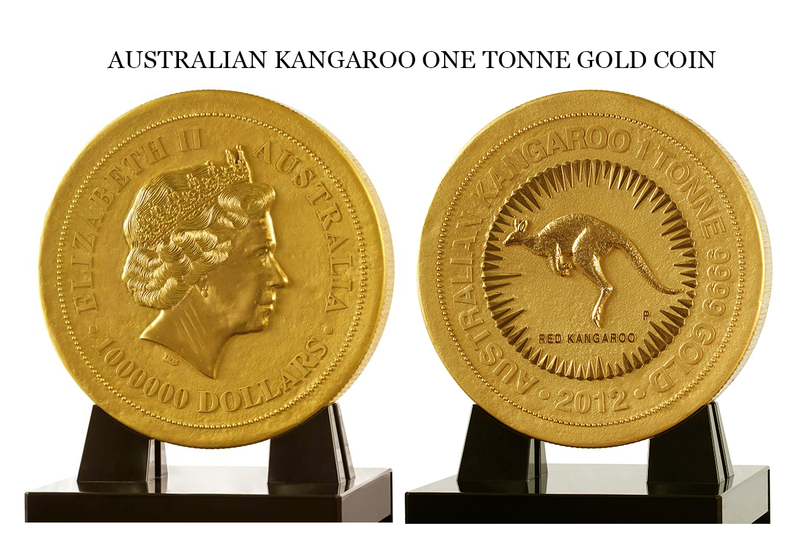 In the photo:coins of the Australian gold series “Kangaroo Gold Bullion”. In the center on the stand a thousand-kilogram coin is placed. 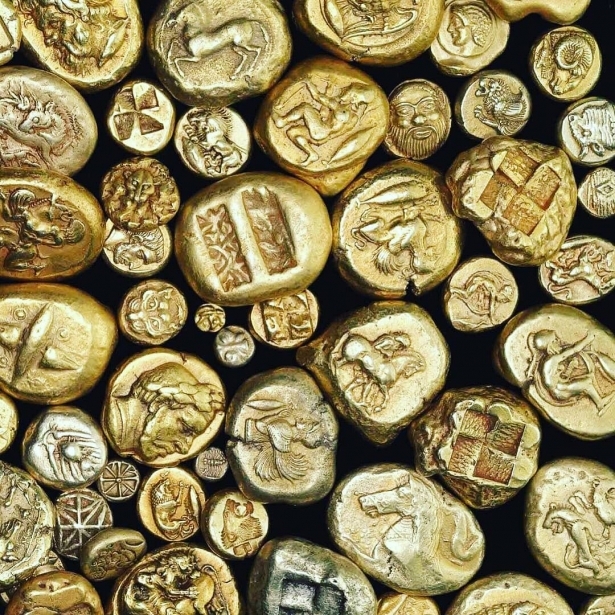 There are coins weighing 1 troy ounce and 1 kilogram in the lower right corner. A huge coin weighs 1012 kilograms and contains 99.99% of gold. It was cast in a special heat-resistant form, and then manually refined by craftsmen. Such a coin is the greatest achievement of the Perth Mint since it’s foundation in 1899. In the photo: An additional texture layer gets handcrafted on the surface of the coin. 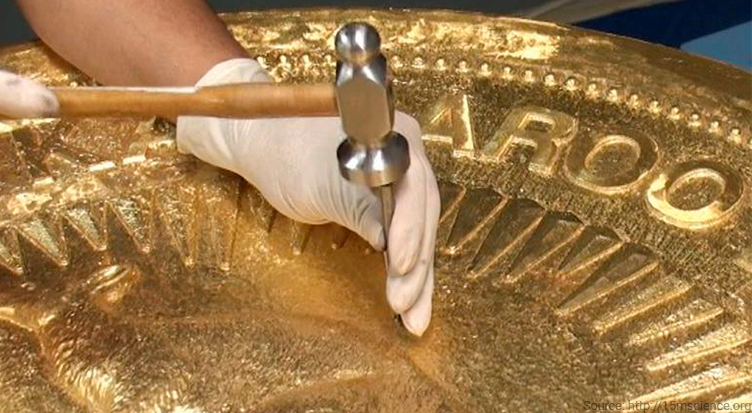 This coin is not only the heaviest one in the world, but also the biggest to date — 80 centimeters in diameter and 12 centimeters in its width. In addition, it has the status of the most valuable coin in the world. Its nominal value is one million Australian dollars, but the real value of 1012 kg of gold is estimated at $39 million dollars. 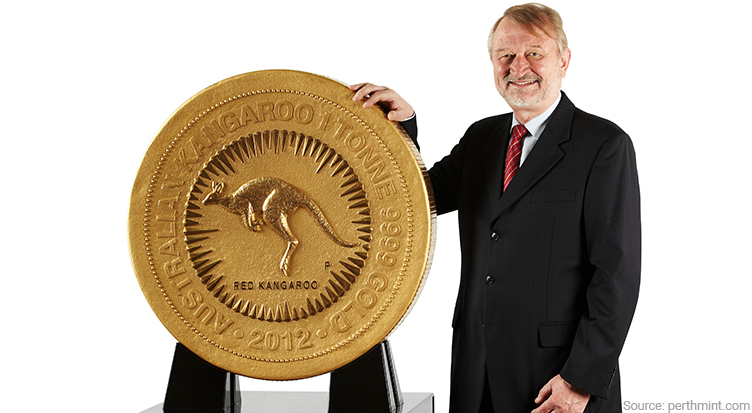 In the photo: Ed Harbuz, CEO of Perth Mint, presents the biggest coin in the world. On the reverse, the artists depicted a red kangaroo, the biggest of Australia's marsupial animals, stylized in the rays of the rising sun. 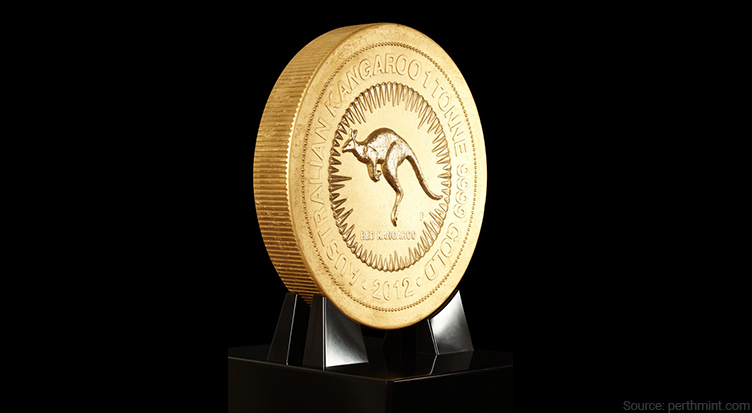 In the circle, designers inscribed "Australian Kangaroo One Tonne 9999 Gold 2012". On the obverse, the image of Her Majesty Queen Elizabeth II can be seen. The inscription is as follow: "Elizabeth II, Australia", "$1 million." In the photo: The coin with the image of the most popular animal in Australia is estimated at one million dollars. The giant coin is the legal means of payment in accordance with the Australian Monetary Act of 1965. In the photo: The bas-relief of the Queen of Great Britain is placed on the front side of the coin. It is the work of artist Ian Rank-Broadley. 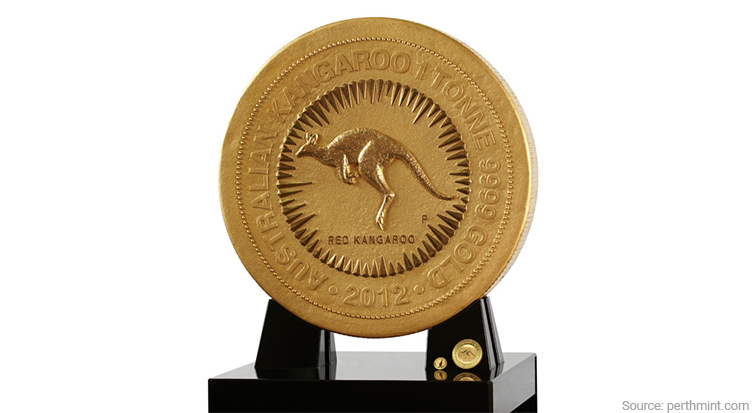 In 2012, the "Kangaroo One Tonne Gold" coin was awarded the official title of "The Biggest Coin in the World" and was listed in the Guinness Book of Records. 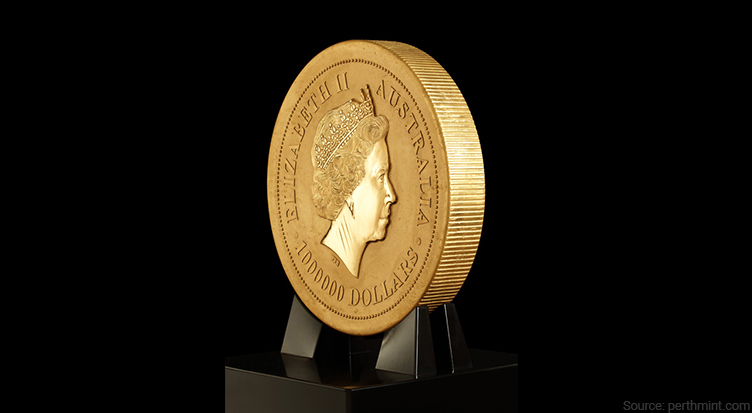 The monumental coin is on permanent display at the gold exhibition in the Perth Mint. 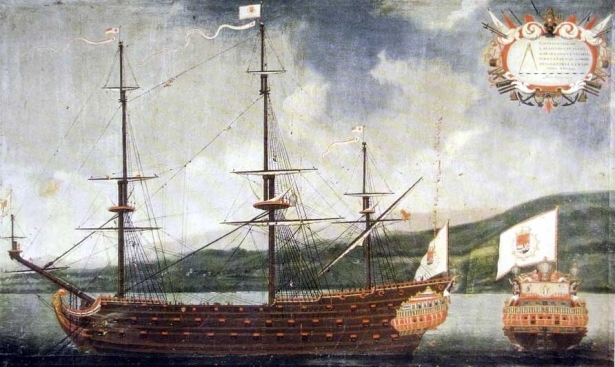 Stealing the coin will be rather difficult, given its huge weight and security measures. The "Kangaroo One Tonne Gold" coin is not for sale either.